Oil is pumped into the treatment tank passing through the first particulate removal element. Oil is drawn into the VDOPS by a high output vacuum pump. The oil passes through another particulate removal element and then onwards to a series of low watt density heaters where it is heated to an optimum 66ºC temperature for the dehydration process. Next the oil enters the vacuum chamber passing through specially designed dispersal elements which create a thin film of oil that is exposed to vacuum. The boiling point of water is below the 66°C temperature at vacuum, so water and dissolved gases are “boiled off” and the fluid is effectively dehydrated..
Vapourised water is then drawn into the condenser where it becomes liquid and drains into the condensate tank. The dehydrated oil flows to the bottom of the vacuum chamber and is removed by the discharge pump. The oil passes through a 3rd fine filter. PROPEL Oil Management’s ‘5 time multi-pass’ procedure maximises results by cycling the entire treatment tank 5 times. Oil is then renewed by blending new additive content. 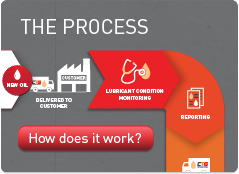 Once blended, the oil is certified in preparation for return to the customer. 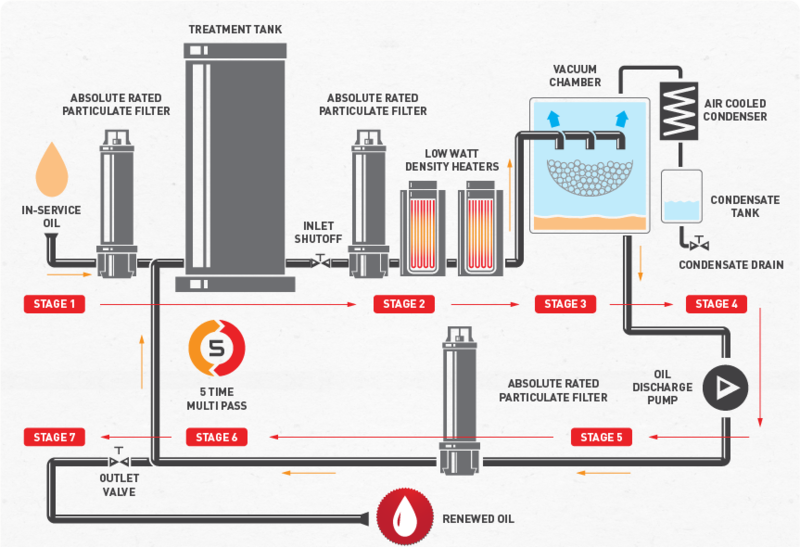 The VDOPS (Vacuum Dehydration Oil Purification System) machine is central to the PROPEL Oil Management process. www.realibilityweb.com state that “The most effective water removal technology is vacuum dehydration” and “A vacuum system will remove water from any oil; brand new or old, good or poor quality”. The VDOPS machine provides the foundation for lubricant filtration and dehydration. With a flow rate capacity of nearly 200 litres per minute it is capable of purifying the largest lubricant tanks quickly and efficiently. Additives are blended to filtered and dehydrated lubricant to restore the lubricant to as new specification or higher. At the top of the page is an image of the VDOPS machine highlighting key components. Contaminated oil is drawn into the VDOPS by a high output vacuum pump. The oil passes through a particulate removal element and then onwards to the low watt density heater where it is heated to an optimum 66°C temperature for the dehydration process. Next the oil enters the vacuum chamber passing through specially designed dispersal elements which create a thin film of oil that is exposed to vacuum. The boiling point of water is below the 66°C fluid temperature at vacuum, so water and dissolved gases are “boiled off” and the fluid is effectively dehydrated. Vaporised water is then drawn into the condenser where it becomes liquid and drains into the condensate tank. The dehydrated oil flows to the bottom of the vacuum chamber and is removed by the discharge pump. The oil is pumped through the high efficiency particulate removal filter element and back into the reservoir. The particulate removal filter removes 99.9% of its rated micron size in a single pass, however with the PROPEL Oil Management “5 time multi-pass” procedure the lubricant is re-circulated five times to maximise filtration and dehydration results.